Ultimately it was a day of near misses at the 9th edition of the RAK Half Marathon on friday, for despite the usual cool, calm weather at the 7am start, not to mention the enhanced course routing to reduce the number of corners, the men’s field chose to watch each other and ran strategically, while the women set off perhaps too fast and paid the price. In terms of legs against the clock, it was ladies’ day, as New York Marathon Champion Mary Keitany pulverised a high quality field, posting yet another astonishing time on the way to her third RAK title. 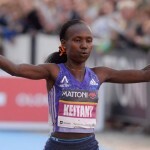 Her run to 66:02, appeared early on to be a definite assault on Florence Kiplagat’s astonishing 65:12 world record of this time last year, and for well past half way, things were going to plan. 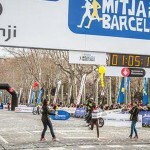 The diminutive 32 year old passed 10k in 31:07 (Kiplagat 31:08), held the requisite tempo (3:05/km) till the 14th kilometre and at 15km (46:42), she was only 7 seconds down on Kiplagat’s mark from Barcelona. But while the Mary Keitany of late 2014 might have maintained the challenge, this 2015 version, very much focused on the London Marathon ten weeks away, had to give ground, covering the second 10km in 31:28 (Kiplagat 30:48). Two kilometres later it became apparent that the target was now her course record (and then world record) of 65:50 set in 2011. But while that slipped by too, the reason could well have been the need to focus on the race at hand, for 22 year old Mamitu Daska of Ethiopia, proved a stubborn challenger when others had receded, and only lost ground on the would-be champion at around 17km. Once clear of Daska, who herself had a breakthrough season of road racing at shorter distances in 2014, the two-time London Marathon champion opened a significant gap, but even her 2011 mark had slipped away, all be it only by 12 seconds. 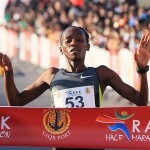 Her winning time of 66:02 has none the less only been bettered by herself and Kiplagat in the history of the event. For one who runs so positively – Keitany has never been afraid to front-run – it was a surprise that it was her first 10km that disappointed. In her record run, she reached 10k in 30:45, but this year it was 31:07. 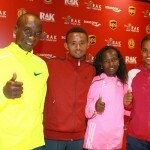 For Daska, the frustration of losing by 26 seconds was softened by setting a new Ethiopian Record, her 66:28 lopping a full 28 seconds from Meseret Hailu’s national mark set at RAK in 2013. 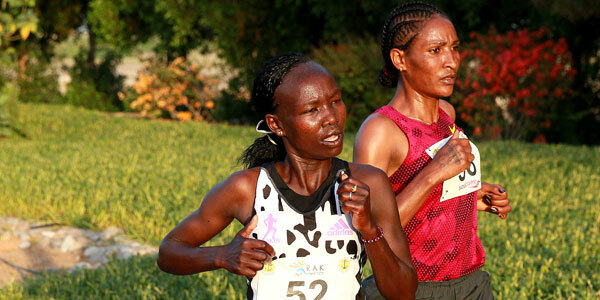 And behind her, huge progress was made by both Cynthia Limo (68:24 > 67:02) and Josephine Chepkoech (68:53 > 67:32). The men’s race didn’t unfold according to script from the off. A dawdling first 5km of 14:33 was many seconds off the mark, but it did contribute to the sense of anticipation, as the tempo remained awkwardly slow. With 10k reached in 28:56, it was natural to expect a surge, but when it did manifest itself, it was not decisive enough and the pack was still nine strong at 15km. At this point, with any chance of a fast time gone, the athletes started watching each other and it became apparent that even breaking one hour was unlikely. Sure enough, while the packing through the finish line was impressive, the overall winning mark was not as fast as the organisers had hoped. Mosinet Geremew’s 60:05 was only six seconds ahead of Edwin Kiptoo’s fourth place and pre-race favourite Kipchoge, had to settle for 6th place (60:50). Perhaps the biggest surprise of the day, was the relatively poor performance of Eliud Kipchoge, who seemed such a strong challenger after his 2014 exploits, but who dropped back at around 16km and struggled from there on. For some RAK 2015 was a day to rejoice and maintain their course, but for others it was useful feedback at a time when there is still an opportunity to tweak things and get their running back on an even keel, or perhaps to plough on in the knowledge that hard times now, lay the foundation for fresh legs and great racing later in the year.